As a real estate agent, one of the best ways to start generating referrals is to construct a referral database composed of all the people who are likely to help you by referring your services. Most referrals come from family members, friends, current clients, past clients, people you’ve met through networking situations, and people you know through social or business dealings. It’s people you either have a personal contact and connection with or know through online and social-media platforms. If you’re like most agents, your first list of business and social contacts will look embarrassingly short. That’s because few people dig deep enough to think of all the people with whom they have business and social ties. To jog your memory, use the worksheet shown here. Then list the names of people in each category who know and respect you and may be willing to refer prospects your way. 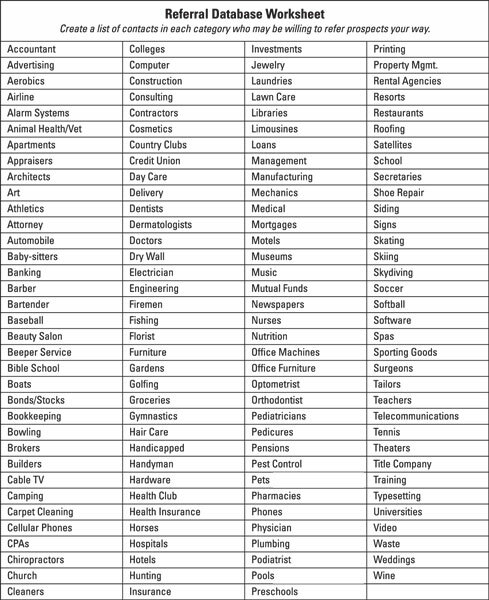 List the names of contacts in as many of these social- and business-contact categories as possible to form your referral database.